Students’ social-emotional learning needs, such as behavior, absenteeism and mental health, have emerged as a major concern for principals over the past 10 years, according to the recently released 10-year study of the principalship, conducted by the National Association of Elementary School Principals in partnership with the University Council for Educational Administration. Principals didn’t express such concerns in 2008, the last time the survey was conducted, but now they report that addressing these issues are a high priority. Edward Fuller, an associate professor at the Pennsylvania State University and Scott Richardson, a doctoral student at the University of Virginia, discussed the results of the new survey during a Tuesday afternoon session on the second day of the NAESP conference in Orlando. The number of hours principals are working per week has dramatically increased since NAESP began conducting the survey in 1928. At that time, elementary principals worked roughly a standard 40-hour week. By 2008, they were working an average of 56 hours per week, and now that the demands on principals’ time has increased to 61 hours a week. Ironically, principals who attended the session said the reason they chose elementary instead of secondary education was so they could have more time with their families. A recent update from the Education Commission of the States shows that some states are rethinking their evaluation requirements, such as limiting or completely removing achievement data from their evaluation systems. But that may not mean the time principals spend on evaluations will drop back. Principals also responded that on-the-job experience, as both a principal and a teacher, contributes most to their success as a principal. But mentoring and coaching is also valuable, just as research has shown for teachers, Fuller said. Even if they are effective school leaders, almost 40% responded that no one ever tells them they are doing a good job. There is also a trend toward less authority over decisions affecting their schools, and principals said they worried the most about issues they could not control. Principals also report being evaluated more often — an outcome of the Race to the Top federal grant program. But Fuller noted that states and districts often use inaccurate measures to evaluate principals, such as student proficiency rates on state tests. Talking with students and parents about a principal’s performance is a better measure, he said. “There’s no one thing you can look at and say ‘That’s a good principal; that’s a poor principal,’” he said during the conference session. If principals are concerned about developing students' social-emotional skills, there are ways they can support their teachers in making SEL a larger part of instruction, Lauren Porosoff, a 6th grade English language arts teacher, told principals in a morning session. Integrating SEL into academic instruction by including an exploration of values and emotions into faculty meetings, giving teachers flexibility in classroom-based SEL activities and allowing time for teachers to observe classrooms and plan with each other during the school day can help teachers better blend SEL into content-focused lessons and projects, said Porosoff, who teaches at Ethical Culture Fieldston School, an independent school in New York City, and writes books with her husband, a psychologist. She led the principals in a series of protocols that teachers can use to help students reflect on how they feel about what they’re learning, communicate with and listen to others’ perspectives on schoolwork. 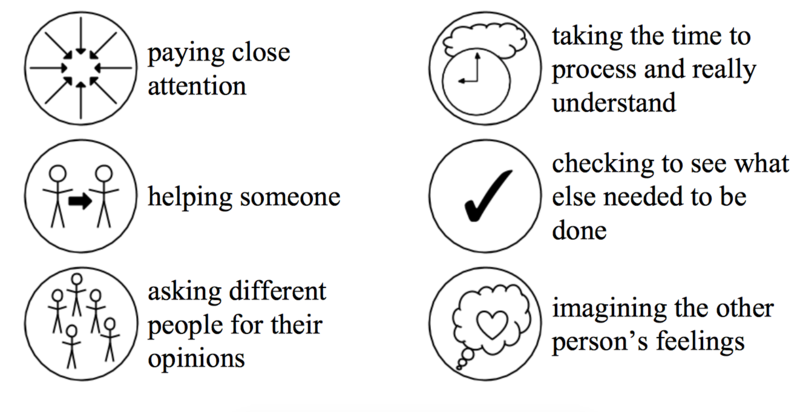 Students create focus stickers, for example, by listing tasks or behaviors involved in a lesson or academic project that they feel went well for them. They create icons for those behaviors, such as a question mark for asking questions, draw the icons on the stickers and then put the stickers in places where they want to be reminded to use those behaviors. The exercise, Porosoff said, helps students “control what they do so they do what they value” instead of acting on impulse. The protocol can be used at the beginning of a unit to help students create a more positive and productive approach toward the lesson. Collaborative conversations, another exercise, help students learn how to listen to each other as they discuss tasks related to a lesson and respond to each other's answers about those tasks. Then they have a follow-up talk about how the conversation went — an aspect that can be awkward for students at first but is “the kind of thing they get better at the more they do,” Porosoff said. The strength of the conversations is that students are “talking about academic material but also learning to listen to each other.” Teachers, she added, could use this process for discussing new policies or assessment data. Students in many classrooms rotate between different settings and educators, depending on their learning needs. In a unique session Tuesday, principals and other administrators participated in a similar type of format to learn about issues such as technology, school security and recruiting teachers who are more likely to stay and be happy at their jobs. Except in this session, the presenters did the rotating, while the attendees used a radio device from Microsoft to listen to the speakers. The format allowed three presentations to be held simultaneously, which is likely to be occurring in open classrooms where teams of teachers are working with small groups of students. Bean stressed the importance of forming connections with law enforcement agencies to help with issues such as monitoring of students’ social media behavior — especially if it raises concerns — and to make sure that when information is released to parents about an incident, that it is accurate. “Too much has been dumped on the schools — way too much and way too fast,” he said. Digital citizenship lessons should begin in elementary school, Bean said, suggesting that principals create fake social media accounts in order to keep tabs on what students are posting rather than relying what someone said a student posted. But he also emphasized the value of regularly talking to students about safety and cyber security issues, conducting regular student surveys and participating in Facebook discussions with parents when they express concerns over how a school handled a particular issue. “You can put out fires there yourself,” he said. Finally, he urged principals not to wait for federal school security grants before making changes and hold staff members accountable for implementing safety measures. In another presentation during the same session, Tim Hodges, the director of research at Gallup, told principals that their two most important decisions are the teachers they hire and what they do to keep them there. He encouraged principals to get more involved in the recruitment process and to look at the colleges producing the educators with the most talent and who are engaged in their work. “Teachers who love their job are surrounded by students who love their school,” he said. Because most educators being hired are millennials, Hodges added that they are more interested in growth and development at their jobs instead of just showing up for a paycheck. 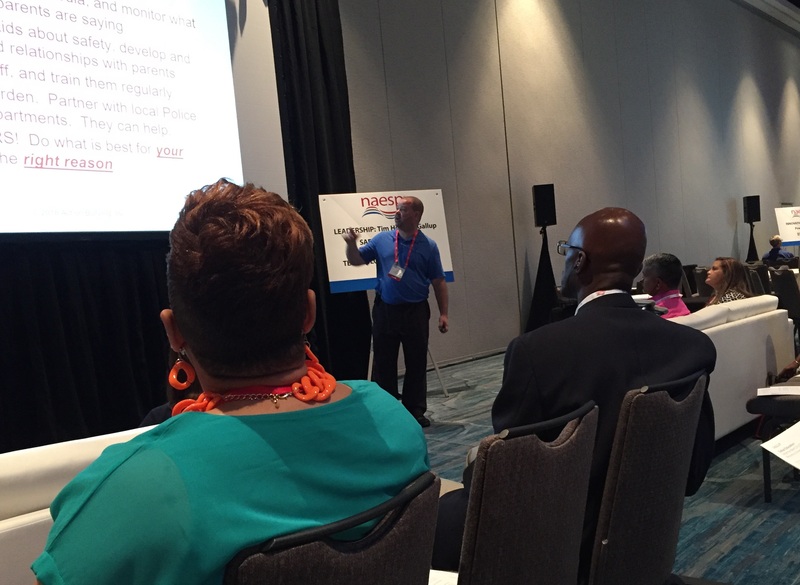 One rotation session focused on school security.